Wow, it's hard to believe that a new catalog is just around the corner! Come July 1st there will be a new catalog filled with great new products from accessories to stamp sets! Here's a sneak peek of a new hostess set called Kind and Caring Thoughts. Most of you know I rarely use hostess sets. However, the images and words on this level 3 hostess set really caught my eye. I love big, bold images and I love the different fonts used on the words in this set. I think it will easily become a favorite of mine. 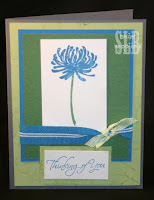 I did this card for this week's Color Challenge over at Stamping Addicts. I also made this card with my cousin Margie in mind. She found out this week that the cancer she's been fighting has moved into her bones. She's optimistic and is going to be starting an aggressive treatment, but if you would keep her in your thoughts and prayers I would appreciate it. Have a great weekend everyone and Happy Stamping!! Such a beautiful, simple card. Love your color scheme. Your card is precious. So sorry to hear your cousin is battling that dreaded disease. Will most certainly keep her in my thoughts.